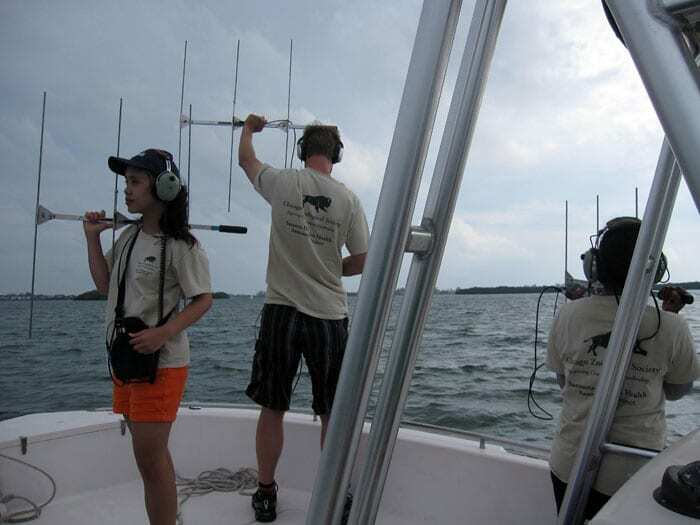 Tara Thean started off her Summer Fellowship with a field trip to Sarasota Bay, FL, where she joined the Chicago Zoological Society’s Sarasota Dolphin Research Program in using tracking and tagging devices to find individual dolphins in the Bay and recorded dolphin whistles. Back in the lab, Tara spent hours listening to dolphin vocalizations and identifying signature whistles. I have some good stories for friends and family who ask how my summer is going. As a Summer Student Fellow at the Woods Hole Oceanographic Institution, I get to describe how I boarded a high-speed research vessel to learn how to use oceanographic sampling instruments, even if I wasn’t collecting any data myself. I tell them about my (large, free) house on Oyster Pond Road, where I live two minutes away from the blue waters and soft breezes of Vineyard Sound. I explain that WHOI pays me to invest my mind and energy into a project I find fascinating and to meet friends whose interests in the scientific world dovetail nicely with mine. But the most meaningful bonus of this fellowship to me has been one I have only recently been able to articulate, as my time here approaches its end. I began my research long before I arrived at WHOI, flying out to Florida in the spring to gather biological, behavioral, ecological, and health data on the bottlenose dolphin community in Sarasota Bay with the Chicago Zoological Society’s Sarasota Dolphin Research Program. In the week I spent with an 80-person team of vets and scientists, I recorded dolphin whistles and touched my first dolphin. I then came to WHOI in June to analyze the data with the guidance of research specialist Laela Sayigh, where I spent hours listening to recordings of dolphin vocalizations and extracting the signature whistle – a stereotyped, identifying acoustic signal unique to each dolphin, like a name – of each dolphin from the recordings. I am now investigating whether there is a relationship between how often a particular dolphin associates with another individual, and how similar that dolphin’s signature whistle is to that of the individual. In doing so, I hope to shed some light on how selective pressures and social interactions may modify vocal learning, an ability we most frequently associate with parrots, songbirds, and ourselves as humans. Carrying out this project takes time – I work with data from 1975 to 2012, which means I’ve stared at enough Excel spreadsheets to make my eyes turn rectangular. But even as there is enough to do to fill 12 hours a day, every day, I know I have the freedom to come into work at midday and leave later at night if I wanted to. When my eyes get tired of staring at Adobe Audition, I head to the beach for a few hours with a drink and some papers from Nature that are relevant to my project. It is completely acceptable to go sailing during lunch hour. I can travel during the weekdays because most of my work is portable. While these things could be taken as a green card for slacking off, this ownership of my schedule and project represents, to me, a signal that WHOI trusts me to use my time well and do good, honest science with a seemingly limitless repertoire of data that took chunks of time and money to collect. It’s a nice feeling to be treated like a real scientist rather than the undergraduate work-in-progress that I am. This ownership, this trust to be a responsible detective of the natural world with 37 years of hard-earned data, has meant more to me than any free barbeque, illustrious lecturer, or group softball game that WHOI has thrown my way in these wonderful months. Nicole Marshall volunteered for a field sampling event with MIT/WHOI Joint Program Chemical Oceanography student Evan Howard (taking the photo). MIT EAPS graduate student Guy Evans (in the canoe with Nicole) volunteered for the field sampling event as well. 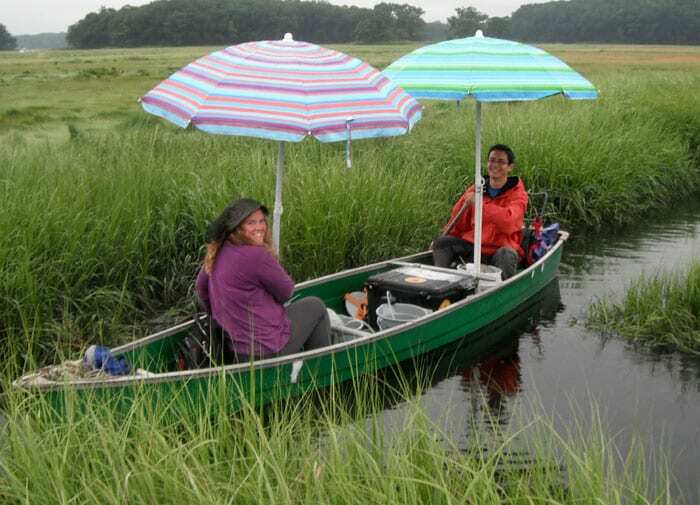 Sampling occurred in two tidal creeks in the Plum Island Salt Marsh in Rowley, Massachusetts. The umbrellas kept us dry from the rain and shaded from the sun. We collected water samples, temperature and salinity measurements for 3 days in July. . Being surrounded by such a variety of oceanographic research during my Summer Student Fellowship at Woods Hole Oceanographic Institution (WHOI) was incredible and this experience has left a lasting impression about my view of the ocean and how we study it. I see the ocean differently after being at WHOI. When I look at waves entering the surf zone on a beach, I no longer see one wave at a time, I now see a whole range of wave frequencies and speeds combining together to create the intricate sea state crashing on the beach. My summer research project at WHOI took place at the U.S. Geological Survey (USGS) Woods Hole Coastal and Marine Science Center. My project was an analysis of ocean responses to storms off of Fire Island, New York. My work showed preliminary results of ocean behavior above a sand ridge field a few miles offshore Fire Island, in about 18-22 m water depth. I was looking at how the alongshore and cross-shore components of the current velocity with depth in the water column changed during the study period, and correlating that data with different local storm events. I made time-series figures in MatLab and several videos showing current vectors changing over time. My results, when combined with sediment data, are essential to understanding net sediment transport direction within the ridge field. I am forever grateful to my advisors, Dr. John Warner and Dr. Jeff List, who taught me so much about coastal oceanography and sediment transport in the 3 months that I spent at WHOI. One of my favourite days at WHOI was the day I spent onboard the R/V Tioga. I saw numerous oceanographic instruments in action. Summer Student Fellow, Chris Kelly (Lafayette College, PA), and I received hands-on experience using the Van Veen Grab Sampler, which we used to collect a seafloor sediment sample. It was really exciting to take our grab sample and analyze the organisms that were sitting at or near the seafloor, which were subsequently crawling around underneath the objective of the onboard microscope! I volunteered as a field assistant for a group in Marine Chemistry and Geochemistry (MC&G) at WHOI in July 2012 (See photo). There was a three day field sampling event from a canoe in a tidal creek in Rowley, Massachusetts where I took water samples, temperature and salinity measurements throughout high to low tide. This fieldwork was data collection with MIT/WHOI Joint Program Chemical Oceanography student, Evan Howard. I learned a lot during that field sampling event about water chemistry, sample collection (do not get gas bubbles in the tubes of the water samples! ), and about what it takes to be an efficient field assistant. My summer research project has inspired me to continue sediment transport studies for my future graduate research. The Summer Student Fellowship program at Woods Hole Oceanographic Institution is an outstanding program because it has shown me not only why we study the ocean, but it has shown me how to study the ocean. For that, I am eternally thankful to have had the opportunity to spend my summer at Woods Hole Oceanographic Institution. This Porites species coral core (Ngerchong 316A) is from an exposed coral reef on the southeastern shore of the Palauan archipelago. 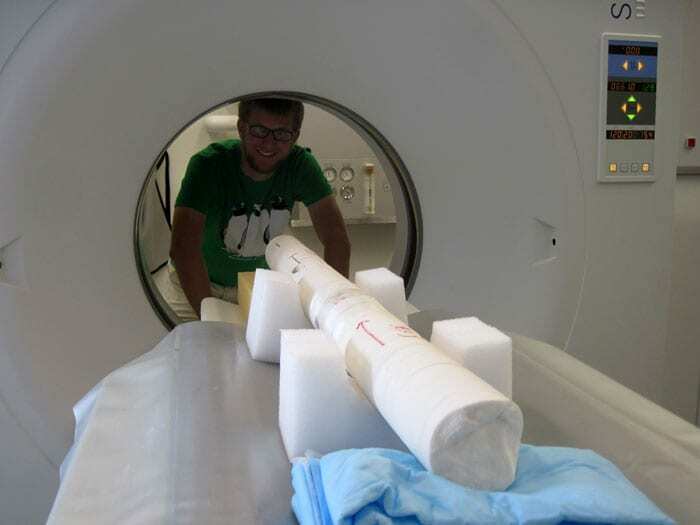 By CT scanning the core, we are able to reveal the annual high-low density bands that the coral forms, much like x-ray technology, but with the added bonus of being able to three-dimensionally reconstruct the core. This ability minimizes concern about drilling precisely on-axis and allows us to rotate the computer projection of the core to pick out the images that exhibit maximal band clarity. By measuring the distance between low density bands this summer, I used this 100+ year old coral to shed light onto the timing and pattern of recent coral growth rate declines in Palau. Coral reefs have become a hot topic issue over the last few years in the face of climate change (pun intended). Many people are working to better understand these ecosystems, so they can be better preserved. However, growing in the cold waters of New England, is another coral species, one that may prove to be a valuable model system to understand interactions between coral and their symbionts. Astangia poculata, the Northern Star coral, can live with or without algal symbionts. This relationship is of particular interest, as tropical coral cannot survive very long without their resident algae. With the guidance of Drs. Amy Apprill and Colleen Hansel, I studied the production of reactive oxygen species (ROS), specifically, the superoxide molecule, by A. poculata and in the members of its holobiont. In tropical coral, internal ROS is associated with detrimental effects such as coral bleaching. However, externally, little is known about the production of the superoxide molecule. Drs. Hansel and Apprill have previously studied ROS production at the surface of several tropical corals and found no correlation with bleaching status, and more thermally tolerant species appear to produce more ROS. This presents an interesting conundrum to the traditional story of ROS being a negative molecule in the coral ecosystem. A. poculata was selected for study as it can thrive without algal symbionts, allowing us to separate the contributions of ROS from the coral and algae. We also eliminated the surface mucus layer microbiome determine if microbes on the coral surface contributed to ROS production. We found no significant differences between any of the corals, regardless of algal symbiosis or presence of surface microorganisms. However, by testing two bacterial species isolated from the surface of A. poculata, we found that microbes living on the surface produce superoxide at biologically relevant levels, in vitro. This suggests that A. poculata controls the production of external ROS. Determining the mechanism of control could yield insight as to how tropical coral control superoxide levels in their immediate environment, and what role this may play in ecosystem health. Throughout the summer I learned invaluable skills working with two amazing mentors. My experience extended much farther than the lab however, as I was invited into the research community, to attend lab barbecues, sail for the first time, meet for dinner with the Chilean producers of a film about the resurgence of blue whales, and make friends that I still talk to almost every day. Being surrounded by dedicated and passionate people inspired me to push my boundaries, both in research and personally. I cannot speak highly enough of the SSF program, nor the people that run it, nor the community at Woods Hole.